There’s a certain kind of story – a certain formula – that when done right almost always works on the big screen. One of the most successful is the Hollywood disaster epic, a formula becomes even more interesting when it’s attempted by an international production. Road Uthaug’s The Wave is a perfect example of this. In it, we find ourselves in the picturesque Norwegian village of Geiranger, located on the shores of the Geiranger Fjord. It seems the mountains above the fjord are unstable, so a team of geologists monitors them around the clock for signs of impending landslides, particularly along the Åkerneset crevasse. The fear is that a large slide could trigger a tsunami big enough to wipe out all the villages along the fjord. The geologists are led by Kristian Eikjord (Kristoffer Joner, he also played Murphy in The Revenant), whose family lives and works in Geiranger but is about to move to the big city. As his last day in town approaches, Kristian sees troubling signs that Åkerneset is about to give way, becoming obsessed with the possibility to the point of driving his team (and his family) crazy. Of course, this film is called The Wave for a reason: Kristian’s about to be proven right, at which point the story becomes a race to see who among the cast will survive. For all practical purposes, this is the exact same story as Dante’s Peak (1997), simply in a different setting and featuring a different natural disaster and cast. As with Dante’s Peak, the story works well here, first introducing us to an ensemble of characters its easy to like, then offering a suspenseful scientific puzzle, followed by the gripping spectacle of the disaster itself, and then the pathos of the family survival drama that plays out in its aftermath. Director Uthaug is methodical in moving the story along, yet offers plenty of little humanistic moments that allow you to buy in to the characters, all of which are well acted. In fact, the film is better for the fact that most of these actors are unknown in the States – there’s nothing to pull you out of the drama. John Christian Rosenlund’s cinematography is lovely and atmospheric, composer Magnus Beite’s workman-like score keeps the suspense going, and the visual effects (produced by Filmgate and Ghost VFX) are first rate. Magnolia’s Blu-ray release presents the film in 1080p HD at the 2.39:1 aspect ratio. The quality is generally good, with excellent clarity, color, and contrast. The palette is very much on the cool side, dominated by the subdued blues and greens of the landscape, and it stays that way as the disaster finally strikes in the dim light of evening. It’s not reference quality, but it’s certainly a satisfying image presentation. The audio is available in a great Dolby Atmos mix (7.1 Dolby TrueHD compatible) in the original Norwegian. There’s also an English 5.1 Dolby TrueHD mix, but no self-respecting cinephile would ever bother with that – stick to the original language. The Atmos mix is terrific, with a big wide soundstage, tremendous dynamic range, excellent bass reinforcement, and plenty of subtle surround effects. There’s also lovely use of the overhead channels, not just during the landslide and tsunami sequences, but even earlier, as when the geologists climb down inside the Åkerneset crevasse to investigate readings they think are caused by instrument failure – you can hear the rocks cracking and crumbling around them. This is great stuff. Note that optional subtitles are included in English, English Narrative, English SDH, and Spanish. In terms of extras, the disc offers a pair of featurettes: Behind the Scenes of The Wave (HD – 5:29) and an Interview with Director Roar Uthaug (HD – 4:29), a trio of Visual Effects Breakdowns (HD – 9: 29 in all), and the film’s theatrical trailer (HD – 2:09). You also get preview trailers for other Magnolia Blu-ray titles. It’s all very EPK-type stuff, mildly interesting, but mostly designed to promote the film’s theatrical release. In a nice touch, the disc’s menus feature a dynamic landscape shot of the fjord that starts off in tranquil daylight and then grows more ominous as evening falls, as you hear the rumbling of the distant landslide, the roar of alarm sirens, and finally see the oncoming rush of water. 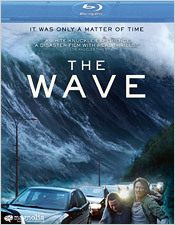 The Wave is a solid and entertaining film of a type that you’ve seen many times before, yet it’s presented here with a fresh international take by extremely capable filmmakers. It’s well worth your time; it makes for the perfect Friday night or Saturday afternoon’s home theater viewing. Do give it a look.